Bumper car-like interactions at the edges of our solar system—and not a mysterious ninth planet—may explain the dynamics of strange bodies called "detached objects," according to a new study. The findings may also provide clues around another phenomenon: the extinction of the dinosaurs. As space debris interacts in the outer solar system, the orbits of these objects tighten and widen in a repeating cycle. This cycle could wind up shooting comets toward the inner solar system—including in the direction of Earth—on a predictable timescale. Interesting conjectures from analyzing new evidence. I wonder if visualized from a distance. Above the plane of planetary rotation. If there would be a slow-motion wave visible, rotating around the Solar System? We won't know until we get an observatory out there. Scientists need to stop chasing little green men and start giving more support to space travel so they can get out there themselves. It's to their benefit to stop complaining every time some money gets moved from their favorite project to space travel. Support something that will get the rest of the world excited (not little green men or microbes on Europa) and it will speed up the time before they get to look from a much better vantage point. Computer simulations based on a paradigm. 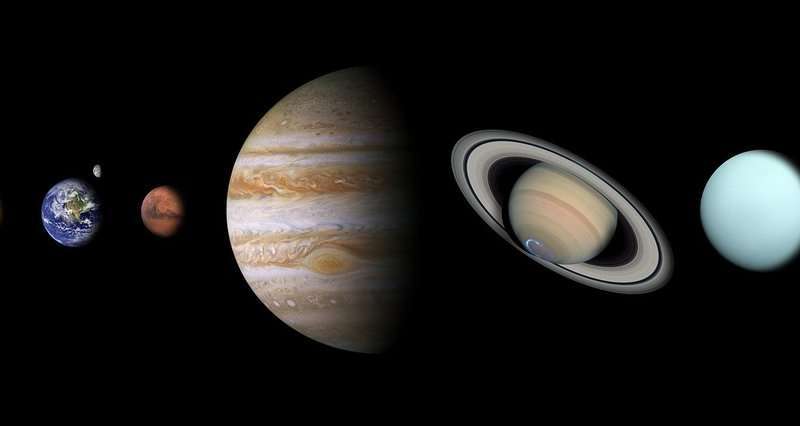 What is observed are what are being called perturbations of the orbits of the outer planets that we presume can only be caused by a large planetary body about four times the mass of Earth, because the paths of these planets defy the predicted trajectories based on what is understood about gravitation. What perhaps we are not realizing is that massive bodies like the planets have inertia, and notwithstanding the fact that gravity acts instantaneously, it will still take thousands of years for the effects of the close encounters of Planet 9 through our solar system to subside so that we realize a state of equilibrium among the orbiting planets. It is my considered opinion that Planet 9 finally collided with Sol, and that this happened after Joshua's long day, when Planet 9 passed through our orbit and temporarily suspended our rotation in sync with the sun's apparent position in the sky. I think it got pulled, no spiraled, in. I'm really surprised that none of them are trying to say it's caused by 'dark matter'. That seems to be the preferred explanation for anything they don't know the answer to these days. We won't know until we get an observatory out there. Scientists need to stop chasing little green men and start giving more support to space travel so they can get out there themselves. It's to their benefit to stop complaining every time some money gets moved from their favorite project to space travel. Support...excited (not little green men or microbes on Europa) and it will speed up the time before they get to look from a much better vantage point. Ha, Maybe it is 'little green men' playing marbles with the solar system. Seriously though, I would have thought (I don't actually know) that the increases in military budgets the world over overshadows the budgets used for the search for life. Rather a campaign for less military spending would be more productive. But before you say so, I know THAT isn't going to happen. The country in which I spend the majority of my time has much poverty yet the government wants to spend billions on a security satellite. James, I do not believe that human space travel is either safe or economical or worth the resources and funding to pursue. If we wanted to really get sirius about space exploration. Robots constructing automated facilities on Luna to produce and launch fleets of reconnaissance drones. would not only be a lot more economical. But collect a lot more data than even a thousand astronauts could accomplish. 24v, Please, oh please! Suggest some other names for the almost incoherent terms: Dark Matter, Black Hole. Big Bang. You'd be my hero if you could sell the new terms to becoming popularly accepted memes! Just remember, "Hope springs infernal!" Dark matter = any matter which has so far been detected only by its gravitational effects. Unfortunately there don't seem to be enough undiscovered planet-like objects (such as MACHOs) to account for all of it. Dark matter is not meant to be an explanation for anything. It's more like a placeholder for things we haven't found yet. One star for "Scientists need to stop chasing little green men..." (we should keep looking, it doesn't cost much and the results - either way - will be invaluable and awe inspiring). Five stars for "start giving more support to space travel!" Z, you use the term "space travel". It sounds like you meant it as a euphemism for "human space travel"? If so, aside from limited space transportation publicly subsidized by taxpayers. Or stockholder subsidies for corporate promotional stunt extravaganzas. The only probable space travel will be very costly, ego-tripping into orbit for the wealthy playing at spaceman boasting. Come to think of it though, if we could convince all the plutocracy to journey to the Moon? They could prove useful as feedstock for the cannibal-zombie-robots. Yeah, finally found a use for the useless creatures!